We can learn a lot from growing peas in the garden, lessons that we can apply to any crop or flower or plant that we want to have success with. Lesson No. 1 is be prepared to plant at the proper time. In past years, I had poor pea harvests because I started my peas too late in the garden, and it would get too hot for them. I realized this last year when I found an old seed packet of my Dad's, with "sowed March 6th" written on it. I had always wondered how my Dad had such good pea crops year in and year out. He planted early! So now I try to get my peas in the ground by St. Patrick's Day, the proper time for my zone, and I've had two back to back years of good pea harvests. Last year I was so excited to finally 'conquer' peas in the garden that I proclaimed it the Year of the Pea. Lesson No. 2 is choose a variety that does well in your area. This year and last year I planted 'Green Arrow' because that's the variety that my Dad sowed in his last garden in 1987. I like it because you get a lot of peas in a pod, at least eight to ten, consistently. I've planted other varieties in the past that had well-written descriptions, but I would only get three or four peas in a pod. This could have been due to planting them late, but it could have also been that the variety just wasn't a good one for my climate. You may have to experiment with a few varieties to see what does well in your garden or ask other gardeners in your area what varieties they grow. Lesson No. 3 is celebrate your harvest. 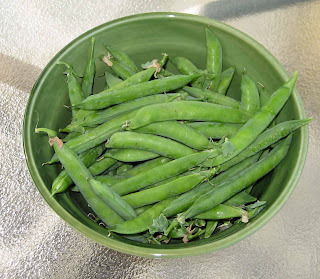 It's not quite the same as the Ritual of the First Tomato, but I do put the peas in a pretty dish and admire them before I cook them and eat them. Lesson No. 4 is don't give up. Looking at my garden journal, I wrote down each year when I planted peas, but there are very few notes about when I harvested peas. Frankly, between planting them late, growing varieties that didn't do well, and having rabbits eat the vines before they could flower, I never harvested enough peas to record it as an event. But I perservered and finally figured out how to grow peas.... two years in a row. They were delicious and worth learning every lesson, over and over again. A sweet and nourishing post, Carol - the peas look delicious and the story of your discovery of your dad's garden hints is very touching. Those are great lessons and testament to even the little records kept on a package of seeds. That and knowledge of local gardeners of experience. The first year I planted peas something ate the seedlings gone (I think now birds). Last year I had to learn about timing. Sure we got peas, but not a great harvest in the summer heat. This year looks good and I might have to try earlier next year, that and test for the best variety. Cheers with your pea harvest! I'm glad someone in the family had a good harvest of peas. Mine looked good until I took the row covers off and the rabbits found them. The the spoon thing working? I may give that a try next time. Love those peas in the spring. How exciting it must have been to find your Dad's handwriting on a seed packet. I bet it felt like a note written expecially for you. I always love to see the handwritten recipes my Mother gave me. Good lessons. Those Green Arrows do look like they have more pea per pod than the Wando. They will be on my list next year. I haven't tried growing peas yet, but the lesson of the pea can certainly be applied to all aspects of gardening. Looking at your posts from the last couple days, I found it interesting how you were going to tear out all your ox-eye daisies when someone else not so long ago was extolling their virtues. Just goes to show the old cliche that "one man's trash is another man's treasure." I'm discovering, too, that the tags or catalog descriptions don't always tell you just how fast something can spread. Googlereader led me here and I am sure glad to have found your blog. 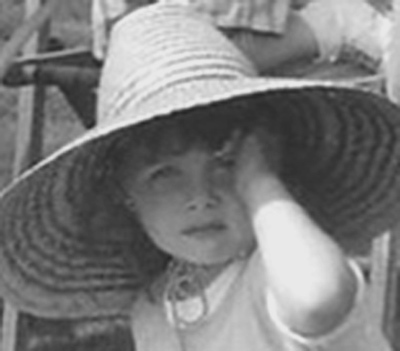 You have a beautifull garden and I already now that there will be so much I can learn from you. So thanks for blogging I will follow along if you don't mind. Thank you so much for your garden thoughts. Reminds me of growing up on an organic farm in East Texas where we grew our own vegetables and we would eat the peas, crunchy and sweet, without even cooking them sometimes. What a wonderful gift from your dad...a treasure you'll have forever...his seed packet and the growing of peas! Lesson number 5: Some vegetables are better raw. Fresh peas straight from the garden are one of them. 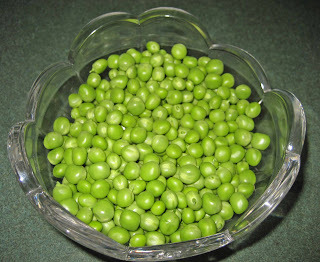 We cook frozen peas just enough to warm them through, but we don't cook fresh peas, just shell 'em and pop them in our mouth. I'm pretty sure I'm in year 2 of planting too late since I just got my first flowers and it's already getting warm here, but who would have thought we'd have 4 days above 90 on the CT shoreline 2 weeks before the first day of summer? Not me. But next year, the peas go in on St. Patrick's Day even if it does feel silly early to be planting. Our sugar snap peas are just about ready! Nothing better! I love peas but didn't get them in early. I am going to try a later crop sowing in mid-July. Eliot Coleman says sixty days before the first frost. We shall see how that goes! I will have to go buy some peas at the Farmer's Market! Oh, your peas look fabulous. 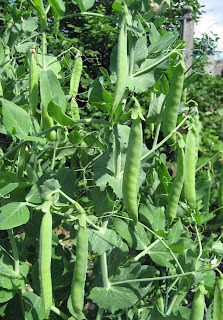 I am getting ready to pick my snow peas which I planted as early as I have ever done - early April. And they look as good as ever, so planting timing is everything!